Introducing the long-awaited “reboot” of miniDSP’s best-selling 2x4 digital audio processor: the miniDSP 2x4 HD! This tiny powerhouse is jam-packed with miniDSP’s tried and proven audio processing functionality: flexible para-metric EQ, Butterworth and Linkwitz-Riley crossovers, advanced biquad pro-gramming, and delay on each output channel. miniDSP’s “one hardware many plugins” concept allows for many interesting future applications! I/O capabilities get an upgrade too, with the addition of USB audio streaming up to 192 kHz and a TOSLINK digital input. 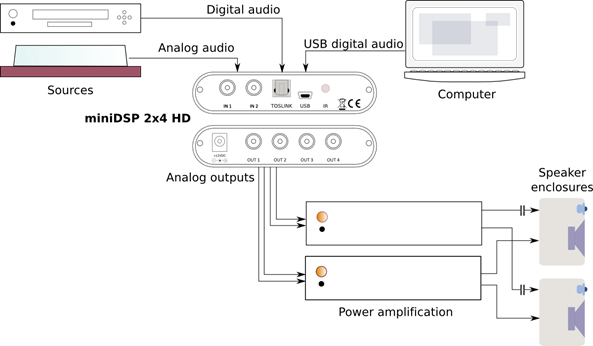 The miniDSP 2x4 HD will find application in full-sized hifi and home theater systems, on desktops, in cars, in recording studios — anywhere a compact, simple, yet surprisingly powerful DSP audio processor is needed.